The blog series with the lore of Rastakhan's Rumble continues and we also get to see two new cards! In the first part, we saw Ticket Scalper and Heavy Metal! Rikkar, the young Troll champion, manages to slip into the arena as he gets acquainted with Krag'wa's Frogs, Jan'alai's Dragonhawks and Bwonsamdi's Zombies. You can read the second part of his story here. This card is way too slow to be see actual play. It is only worth if your opponent has 4 minions on the board and at that point you might as well play Mind Control Tech. 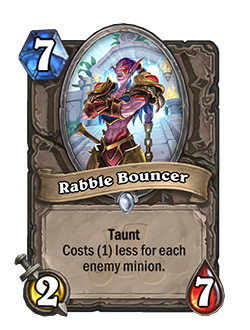 On the other hand, this is yet another minion from Rastakhan's Rumble with 7 health. The Star Aligner dream is going to be realised, boys and girls! It wouldn't be a proper Rumble without a friendly Tuskarr selling funnel cakes soup. This card look good with the Healing Paladin archetype that has started to flesh out from previous expansions and has now received more support with cards like High Priest Thekal and Zandalari Templar. 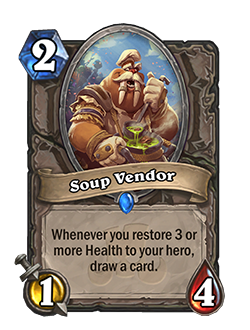 Soup Vendor could also find its way into Warlock decks, like the Healing Zoolock or it could work with Bloodreaver Gul'dan. Lifesteal cards are also best friends with Soup Vendor. The one weakness that this card has is that it requires Health restored to your hero only.